Yep. This is exactly why most couples get absolutely nowhere when they fight. Take a look at this excerpt from our marriage book, How to Fight for Your Marriage Without Fighting With One Another. And, yes, we certainly understand that the roles are often flipped. Just be sure to read the article to the end. When husbands and wives feel a fight coming on, both have a unique way of making battle preparations. While the man loads his cannon of logic, the woman looks to her emotions as a means of defense. It is not too long before both are involved in a battle that has raged throughout the ages between many a husband and wife. It is a battle that has produced few, if any, victors yet many casualties. As the man fires what he deems to be reasonable statements, the woman builds a castle of emotions around herself to thwart off the attack. What happens from here is classic, yet tragic. The man muses within himself, “To successfully storm the castle, I must shoot more cannon balls of facts and logical surmisings over this wall.”. 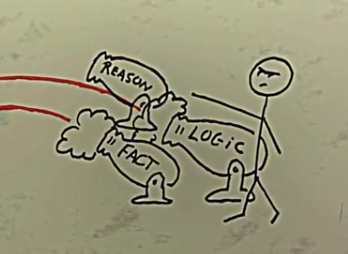 Forgetting that logic based upon false premises is foolishness, he fires away only to have missed one of the most crucial facts of all. No man in the history of marriage has ever been able to scale the heights of that wall. For the more cannon balls of logic and reason that he tries to fire over that wall, it only grows in height and in thickness. It is at this juncture that many men falter. They do not fail in what they are saying for their logic is fairly factual. Their failure lies more in when and how they are trying to convey their thoughts. The wise man realizes that the said wall of emotion is a temporary wall. He understands that time will erode that wall away if he chooses to serve in the moment and convince at a later time. Unfortunately, many men do the exact opposite. Instead of serving now and convincing later, many make the mistake of thinking they will serve their wife once they get everything worked out on an intellectual basis. The problem is that after 6,000 years of world history, this method has seldom proved effectual. 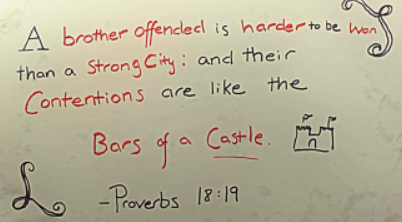 Proverbs 18:19 also gives us further insight on this matter as it states that “a brother offended is harder to be won than a strong city”. It goes on to say that “their contentions are like the bars of a castle”. To put it simply, the verse it teaching us that when a person’s spirit is wounded or closed, it is near impossible to gain entrance to the rest of their being. This is key in that when a person’s spirit is closed to us, we feel that the best way to reach them is to enter through the back door of their intellect. The problem with this thought process is that Proverbs tells us otherwise. In essence, Proverbs 18:19 is telling us that a person’s spirit almost acts as a gate to their respective city. If it is closed, it is improbable that you will gain access any other way. Therefore, in order to access someones mind, you must first open their spirit. And, this is best accomplished through sacrificial service rather than carefully constructed arguments. This teaching will not come easy for the man or the woman that likes to deal with things in the here and now. If you are like me, when there is a problem in a relationship, you want it fixed yesterday. The only issue is that you are not married to yourself. More than likely, you are married to someone that has an entirely different way of processing their emotions and their thoughts. Many a couple will avoid a multitude of late night arguments and free-for-alls by taking heed to this advice. Instead of stomping off and declaring the other person to be absolutely unreasonable, they will find it more effective to serve now and convince at a later time. This usually allows time for that wall of emotion to crumble and the spirit of the other to open. Once this occurs, a spouse will usually have access to the other’s intellect. As noted in our marriage book, there are marriages that have what I would call a role reversal. That is, there are men that put up a wall of emotion while their wives hurl logic and questions about the past in their direction. In our marriage book, we also give very specific advice for relationships that fit this mold. To order our new marriage book, How to Fight for Your Marriage Without Fighting with One Another (Using a 2-step Process), which features our teaching on the Proverbs 18:19 principle, go to our Resource Page. I’ve read your emails for quite some time and have wondered if it could actually help my marriage. Does your material ever cover how to deal with a habitual, compulsive liar that acts like a 3 year old (screaming and yelling, stomping off and giving the silent treatment for days on end) when caught in the act? I made a vow that I don’t want to break. I’ve dealt with this for 19 years now. We help people from all types of backgrounds. In fact, its the beauty of the 2-step process. Whatever background a person is from, it has a way of pulling them from that. We certainly make no guarantees, but we have seen great results over the years. I appreciate that Dr. Force responds to the comments of accusations and falsehoods. Please do not stop doing that. Allowing untruths to go uncorrected does more damage than speaking the truth. Keep up the good work. What do you do when you feel in your heart that your spouse still loves you but other people are hearing different things? Do you believe what they tell you or do you believe whats in your heart? If me and my wife weren’t meant to be married would have god allowed us to get married? Also, if you and your wife have made a covenant, then I would not concern yourself with murky arguments such as, “Were we meant to be married?” If you have a joined in covenant with one another, then I would recommend that the both of you do everything you can by God’s grace to obey your marriage vows. I thought about reading this but you lost me in the first paragraph. Your sexist assumptions are out of date. Men aren’t always the logical ones and women aren’t always the emotional ones. You may want to watch the entire video or read the rest of chapter four in our marriage book as we certainly do address that, at times, there is a role reversal. By the way, Solomon said that there is nothing new under the sun. In other words, people have never changed. We are the same as we have always been for the last 6,000 years of history. You are correct there is nothing new under the sun. Logically her giving him the the fruit holds no bearing on the verdict of his guilt. Emotionally he is finger pointing and trying to justify his own actions through placing the blame onto her. She has to deal with her own sins Rather then the emotional reaction of finger pointing alone she adds a logical reason for the finger pointing by saying the serpant deceived her. To lend on interest, usury. I really appreciate the application of that proverb to a marriage. I felt compelled to comment so that it could be stated here for future viewers to consider that God made two distinct genders who were designed to display the complete nature of Himself within their own unique natures, as it says that we were made in His image and likeness. We share the same natures and imprint of our God, yet displayed in unique masculine and feminine ways. Culture should never define these roles for us but rather the scriptures, which they do. Being emotional does not negate having strong logic and intellect, nor does having a disposition to think logically mean that there is no emotional depth and sensitivity. I have come to greatly respect and appreciate my wife’s higher perceptions of emotions in situations that without her input I would have handled poorly, even in situations that involved other men. For me, it is comparable to her being able to see colors that are in the ultraviolet spectrum which I simply cannot. I marvel at the ability to perceive intangible things which have great effect on an outcome. You wrote: Culture should never define these roles for us but rather the scriptures, which they do. I totally agree. Thank you for your very helpful insight. It is nice to see more than reactionary comments on a blog, but well thought out considerations. A friend said something to me once, when I was having a rough time in my marriage. “Even a wonderful spouse makes a very poor God.” When we expect our spouse to “make us happy, make us fulfilled, make us whatever…. and be our everything…” they will fail EVERY TIME!!! No person can be everything! Very good. I think I will use that! I stopped reading after you said a women prepares with emotion and a man prepares with logic. This is not 1950 and women and men approach relationships based on who they are as a person not society’s stereotypes of how they should feel based on their gender. I have spent my entire life in church and I am very grateful to have leaders who teach out of a place of freedom, not the constructs of gender roles. In our marriage book, we acknowledge that the roles are sometimes mutual or reversed. In fact, if you will watch our video, you will see that we address this also. Keep in mind that in 300 to 500 word articles, we are not able to deal with all exceptions or disclaimers. Also, after this section in our book, we have a section literally called “Role Reversal”. I echo Sara – I stopped reading at the same place and wasn’t interested in reading the subsequent sections mentioned. I think categorizing women as more emotional and not as logical as men is simply not founded. Humans are complex amd unique beings that often fall outside of boxes we like to create. We all use emotion and logic in arguments, no matter our gender. Thank you for your comment, however, you will never win the argument that women are not more emotional in their approach to solving problems. It has been scientifically proven that men have more of a propensity to box up their emotions so that they can go out and fight their respective battles. Also, regardless of what Dr. Bottle-sprocket or Doolittle has to say, common sense is the best teacher. Also, it should be noted that a propensity to be more emotional does not mean that there is a lack of intelligence. It simply means that women are more inclined (generally speaking) to add more of an emotional spice to a situation. This is not a negative as much as a gift without which the world would be a very black and white place. Food for thought. I appreciate your comments. Lol!!! Exactly! Good point Jodi! Even God instructs us to not take verses out of context but to read the before and after also to get the full verse chapter & even book. By being offended @ stopping at the beginning you failed to realize that Dr Force touched base on the possible role reversals. Know the whole story before throwing accusations & blame. I think y’all let your “emotions” get ahead of your “logic” in this case. If the marriage was not founded on love the rest of it is just going through the motions any way. So what are we really fighting for? the ability to say that I survived 10 – 20 or more years of marriage as if it is some kind of marathon or grudge match. I think it is like buying a car. You can like it, you can pay for it but it can still be a lemon. The manufacturer is still glad that you bought it. But it’s your problem now. That is how my marriage is. I want more out of the marriage and I want more out of life. And less aggravation. This marriage that is an emotional shackle on my mind and spirit. Thank you for your question. I am sorry that your marriage is having its difficulties. I will pray for you and your wife. Though I can see your logic, you have a few fautly premises upon which your logic is based. Faulty Premise #1: Marriage is not simply about finding happiness. It is for God’s glory. My purpose is not to be argumentative with you, but to challenge you to think a little differently. #3 he has an entirely emotional stance for his marriage. He hasn’t stated any real problems or any real solutions that have tried and failed.